Bankruptcy asset sales of used edm machinery. Make your bid! Are you looking for used edm machines? Here you can find online auctions, constantly updated, dedicated to the best machinery of the metalworking industry. The prices of the items are determined by the bankruptcy expertise and offers a great savings on the purchase; with the best deal, you can get high quality machines and equipment for your business! We make our best to help all the companies that want to invest in the used market of industrial machinery. For this reason, we created a 2-phases-auction system: during the first phase, you can bid on individual lots, during the second phase, which lasts 10 minutes, you can make an offer for the bulk of items. If no offers come during this phase, the winners of the first phase will be confirmed and can get the individual lots. We suggest to check your account timely: here you can track the closing date of the auction of interest, the bidding activity on your favorite items and also monitor the relaunches of the other participants. If you have any questions, you can count on our team, who will be happy to answer all the questions you may have. Don't miss the chance! 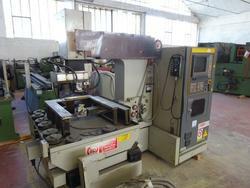 Register for free and bid now for the cheapest used edm machine for sale! Do you want to stay updated about the used edm machines for sale on our website? Subscribe to our newsletter! You will receive a weekly email showing new items on sale.